The winter can cause problems for many flyfishing flats anglers. Creative methods become needed when northwest winds blow, water temperatures drop and flats become a mess. I like to go to the southeast coastal areas where the warmer gulfstream keeps inlet areas toasty. Snook pile up in great numbers and can be seen popping shrimp on the surface under shadow lines around docks and bridges. Shrimp are the key for this mass gathering. During the times around full and new moons, huge amounts of shrimp can be found moving in the current. In some places, they are present on all tides. Not as many as a run, but their presence condition these fish like clock work. Days when strong easterly winds stir up water, the sometime leader shy fish hit better. I have found that a falling tide is best. It always seems to have more food and give the water color. Too clear can be a problem. As far as fly selection, small white deceivers are very productive. Short snappy strips will get explosive strikes. I use larger white clousers for bigger fish that are deeper. These fish tend to average on the smaller side, 20-24 inches. Don't let the size fool you as they fight strong currents and are powerhouses. Line burns are not uncommon. If you're really seeking a challenge then a 5-6 wt. rod is the ticket. I like a little more and use a 7wt. You never know when something much bigger could come along. 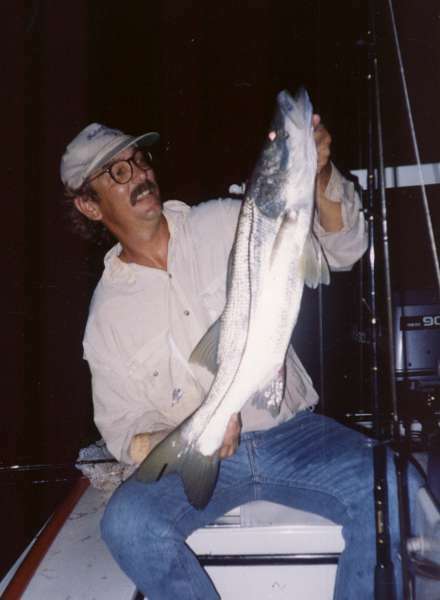 With Snook season catch and release for half of December and all of January, crowds at popular places can be a minimum. A weekday late night trip till daylight will have little congestion. I fish well lit areas with no wake zones for safety purposes. These areas are also the most productive. The best nights have been cold and windy with over 40 fish released! So when weather puts a damper on your flats trip, head for the lights for hot Snook flyrod action! Click on above photos for larger version, remember to use your browser's back button to return.